Educomp Smart Class – The new age classroom where subjects are not just taught, but demonstrated with the help of animation and video clips, on display system and computers.Making learning fun and interactive. Its SAS (Smart Assessment System) even helps teachers assess students accurately. 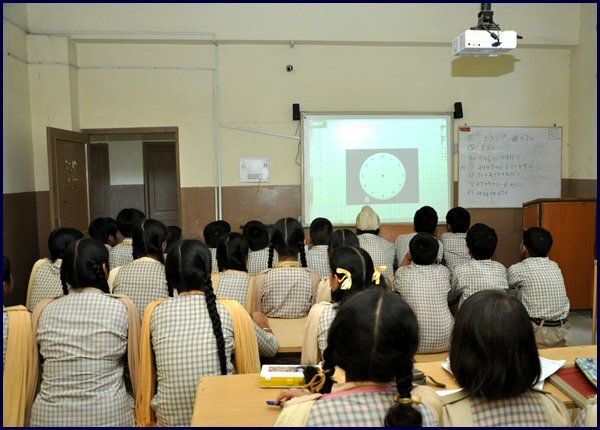 Existing classrooms are converted into technology enable smart class rooms with Interactive Digiboard Systems with a computer connected to a dedicated smartclass. Knowledge centre inside the school campus. Teachers use the digital resources such as animations, video, clips and simulated models as a part of their 35-40 minute classroom period to teach the specific topics in smartclass rooms, enabling a multi-sensory learning experience for the students.